Originating from Ting Xi Village located in southern An Hui province, Lan Xiang tea is one of An Hui province's Top 10 Famous Tea along with other great teas such as Tai Ping Hou Kui, Lu An Gua Pian and Huang Shan Mao Feng. Lan Xiang means Orchid Fragrant, a beautiful name it owes to its naturally sweet orchid-like aroma and taste. Tin Xi Lan Xiang is created based on the highest grading standards. When Deng Xiao Ping (late leader of the Communist Party of China) tasted Ting Xi Lan Xiang for the first time, he made this remark: "This is a good tea that I will be drinking regularly. 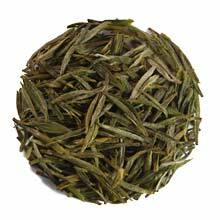 It is comparable to the best Huang Shan Mao Feng and Xi Hu Long Jing". Ting Xi Lan Xiang yields cups of very smooth tea with nutty and sweet orchid-like floral aroma. The after taste is floral sweet which lingers in your mouth after a few cups. Later infusions have hints of creamy taste. Refreshing and delicious. One-bud-one-leaf with long and narrow shape which resembles tiny needle.